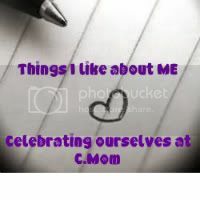 Today I am linking up with C.Mom and we’re all talking about ourselves. Yes, ourselves! And for a change all the things that we LIKE about us. More often than not we as women tend to look at ourselves and find fault in so many things whether they are visible to others or not. I know that I am terrible with this as well as being worried about what others think of me. I’ve always had the issue where I am concerned about what others think of me… am I to heavy, my hair isn’t perfect, my clothes aren’t the latest trends, and the list goes on. Honestly, I know that I shouldn’t care, right? So what do I like about me? Let’s make a list because that’s easiest. Blue eyes – I have blue eyes, dark hair, and as the summer progresses my skin turns a nice golden brown which accentuates the blue color of my eyes. Sometimes I feel that it sets me apart… kinda like the person who has dark brown eyes and silky blond hair. It’s just different. My guess is that the dark hair & skin came from my mom’s side (Italian) and the blue eyes came from my dads (Scottish). 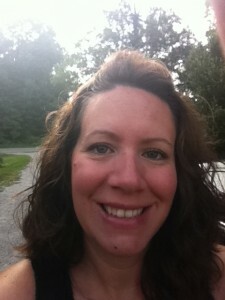 My hair – it’s not straight that’s for sure! It’s really thick and wavy/curly and that makes it pretty easy at times to wash and go! There are times that I wish I had that smooth straight hair that everyone seems to have lately, but I can always straighten it or go curly and make it look great. My ability to let things go – I don’t let things get to me or bother me because I’ve learned that holding on and being upset doesn’t help me or the situation at all. I realize that there are times that this just isn’t possible but for the most part if we all just relaxed and let things go we’d all have a lot less stress and upset in our lives. I think that we can all take a look at ourselves and say that we’re pretty good people and that it’s just the small things that bug us. We let those things get to us and if we focus on the good things we could be happier. We are who we are….let’s embrace us.